Are you a picture book writer? Picture books are close to my heart, and it's the type of manuscript Lisa Bullard and I critique most often in classes, at writers' conferences, and from our Mentors for Rent clients. I love helping writers make their manuscripts stronger and more marketable. There are 10 key picture book concerns that crop up with alarming regularity! Almost every manuscript we see has at least one of them, and most manuscripts have two or three! In this course, I cover 5 of those issues (length, focus, point of view, freshness, and illustration potential), and Part A covers the other 5 (picture book or short story, kid-friendliness, nostalgia, quiet picture books, and sounds/words). [Note: It doesn't matter which order you take the courses in.] In each video, I showcase a key question you will want to ask yourself about your manuscript. Then I offer some tips and techniques to fix the problem if you discover that it does apply to your work. The 6 videos total 1 hour and16 minutes. This course is for you if you have written a picture book manuscript, but you don't know how to make it stronger. This course is NOT a step-by-step how to write a picture book class. However, by watching the videos, you'll gain insight into the demanding requirements and common problems writers run up against. This course is also for you if you want to learn how to analyze your own work and figure out how to approach revision. If you haven't yet written a picture book but you want to give it a try, this course will show you some of the common obstacles to getting your work published, so that you can avoid them! I would never want you to be unhappy! If you are unsatisfied with your purchase, contact me within 15 days, and I will give you a full refund. The picture market is tighter than ever! The insight you'll gain from this course will help you write stronger, more marketable picture books. 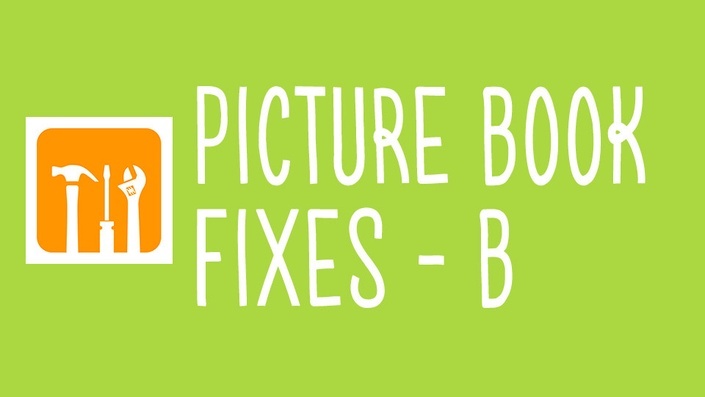 This plan includes access to the five modules (plus one bonus video) of Picture Book Fixes - B. It also includes a downloadable sheet that goes with each video module.